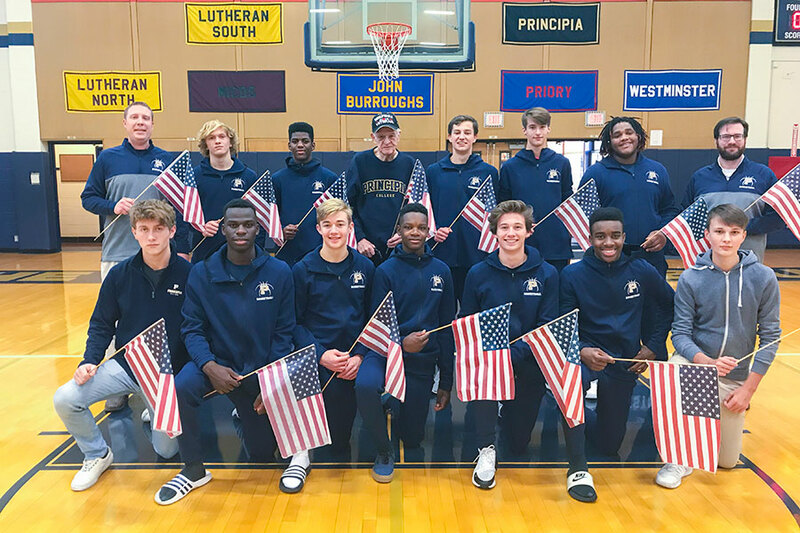 For the second year in a row, the boys’ varsity basketball team is demonstrating a spirit of service along with strong athletic skills by hosting the Honor Flight Tournament, with competition among eight area schools. The tournament supports Greater St. Louis Honor Flight, a nonprofit that periodically flies veterans to Washington, DC, for an all-day celebration of their service through various events and gatherings in the nation’s capital. The inaugural tournament in December 2017 raised more than $3,000. This year, the boys and Head Coach Kyle Johnson (C’09) hope to surpass that amount through tournament fees, individual fundraising, and T-shirt sales. This activity is close to Johnson’s heart, as his grandfather Vince Boemer (C’49) served in the Philippines with the U.S. Army during World War II and was awarded a Purple Heart. Some students on the varsity team also have family members who are veterans. This year’s tournament is being played among eight teams over three days—December 4, 6, and 8. The Panthers won their first-round game on Tuesday and play at 8:30 p.m. tonight in the semifinals. (This game will be livestreamed at this link.) The final rounds on Saturday begin at 11 a.m. and several military veterans have been invited to that day’s games so they may be recognized. The cost (contribution) for attending is $4 for adults, $3 for students, and $2 for children under 12. Specially issued T-shirts will also be on sale for $10. All proceeds from the tournament will be donated to Greater St. Louis Honor Flight. The team is hoping to donate more than $4,000 this year!